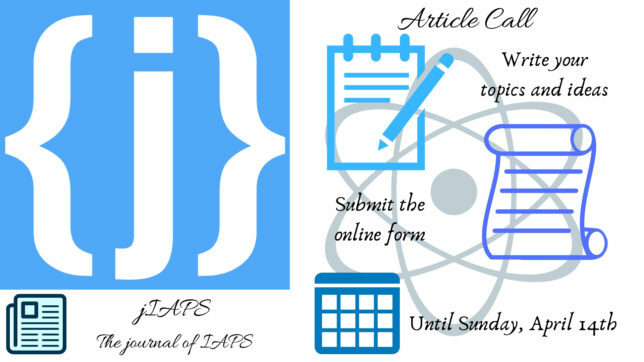 The Editorial Team of jIAPS is looking for article ideas for this year’s edition! So, they have opened a call for article topics until this sunday, April 14th for IAPS members and alumni! If you want to have your work, thoughts or experiences in jIAPS 2019, come up with up to two themes, write your motivation for them and fill in this form with that information! You free to choose various topics and approaches, from the difference of working experience in academia and industry to Science outreach and communication or the importance of diversity and equality in Physics. You have until around the end of May to send the 500-700 word article itself. For now, you just need focus on selecting your topic of choice and submit the form! Answer the call of jIAPS!